The crook is making off with the money in his dinghy! Race to the scene with the police van and track him down with the mobile surveillance station. Detach the trailer, turn the winch and launch the police dinghy into the water for a high speed sea chase. Catch the crook before he reaches his lighthouse hideout and stashes the goods under the wooden boards! Includes 3 minifigures with assorted accessories: 2 policemen and a crook. Last known price is 83% above the initial Lego retail price! The Police Patrol (60045) Lego set is no longer directly available from the sites below. However, 3rd party partners of these sites might still have the set available. 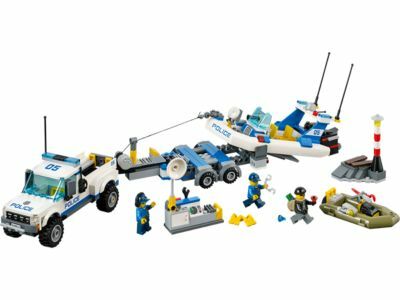 Alternate description Catch the crook with the LEGO® City Police Patrol featuring police van and trailer, surveillance station, 2 dinghys, 2 minifigures and more!